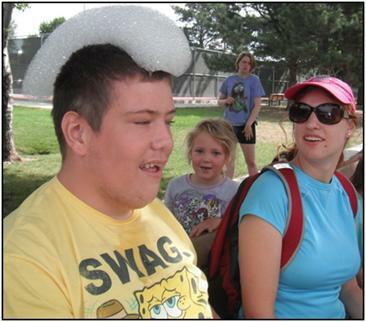 Imagine!’s Out & About Summer Camp wrapped up its 2013 session on August 9. By all accounts, it was a huge success. 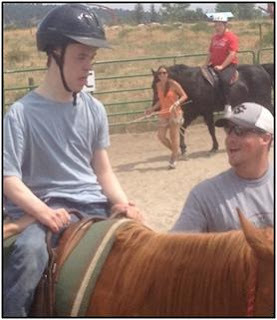 Out & About’s Summer Camp activities include fishing, equine assisted opportunities, art exploration, swimming, movement, sports and games, gardening, as well as lots of scheduled field trips to local venues such as Water World, Elitch Gardens and the Wildlife Experience. The goal of the camp is to provide a sense of acceptance and self among peers, to enhance participants’ quality of life through the development of socialization skills and coordination skills, and to promote community integration. Check out the photos below to get a small sampling of all the cool stuff the campers participated in this summer. Museum of Nature and Science in Denver. 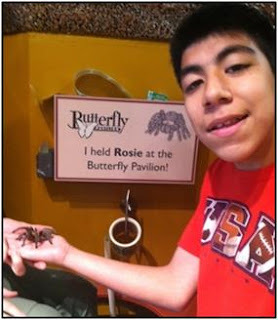 David holds a tartula at The Butterfly Pavilion. 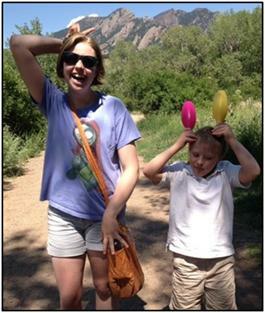 Meredith and Kennedy hike the South Mesa Trail in Boulder. at first, but was laughing and smiling at the end. Shawn and Caden in the pool. Fun bonus information: Melinda Myrick, a parent of an Out & About Summer Camper, made a guest appearance at an Out & About staff meeting following the end of the camp with her daughter Erin and her friend Chris. They brought O & A staffers a big cake. Apparently, the cake was so good, they couldn’t get a picture of the whole thing in time. 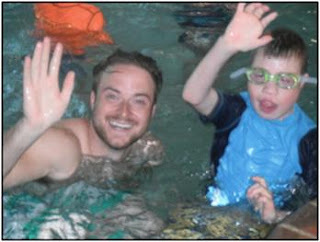 Congratulations to Out & About for another enjoyable summer full of meaningful activities! This week’s installment of “50 Stories, 50 Years” comes from Imagine!’s Director of Innovations Jodi Walters. Jodi offers a great perspective of Imagine!, and offers even better advice about giving thanks to the employees who truly make organizations like Imagine! special. Thank you, Jodi! I started working at Imagine! 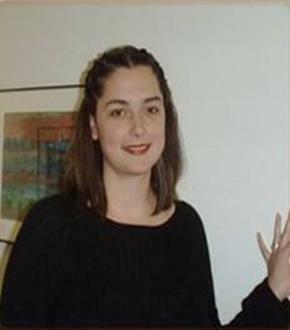 in 1995 as a part-time weekend relief worker at the 19th Street Group Home in Boulder as I was finishing my degree at CU. At the time, my only other experience working with individuals with disabilities had been teaching at a school for people who were blind or had other disabilities in Taiwan. I was immediately smitten. The staff at the home was about the coolest bunch of progressive cats I had ever met. They were nearly militant about community inclusion and had many a conversation about what that meant, particularly for the individuals at 19 Street who had significant medical needs. It opened my eyes. Although the services at the school I taught at in Taiwan were both caring and quality, they were segregated. There were no expectations that those with disabilities might make a contribution to the community. Before Imagine! (then the DDC), I had not thought much about the strengths that individuals with disabilities had and the gifts they could give. I hadn’t really thought that community life mattered for an individual who couldn’t walk, couldn’t talk, and had such significant needs. And, for the first time in my life, I relished the fact that I had been very wrong! Luckily, I would have many future opportunities to be wrong about something at Imagine!, and I have usually found that to be a good thing. I found it exciting and meaningful to be around people who not only cared deeply, but expected to make a difference. My co-workers had quite an impact on my life, and over time these relationships fostered a life-long best friend and a husband. I was also impressed that the environment allowed for expression and change. Very early in my tenure, the staff at 19th had worked itself into a frenzy about something, the details of which are hazy but most likely had to do with low wages and lots of hours, and the whole staff was talking about “striking”. Then Community Living (the name for the residential program before Innovations) director Greg Wellems came to 19th and talked with the staff. He made it clear that our plan to strike would most definitely not get us what we thought it would, but that change was always possible, and ideas were wanted. As our ideas where listened to, with one even being implemented, I was hooked. That’s not to say the work has always been easy or that I have loved my job every day. But, I have always felt listened to, and I have always understood that the ability to partner with individuals and families, to dream, and to inspire change were within my grasp. Years later, big in my britches from realizing opportunities to make a difference, I stepped out of Imagine! to work in the for-profit world. I was immediately sorry and missed the people, staff, and those we served, as well as the ability to contribute. I was shocked that the opportunities and expectations in my new job did not revolve around making positive changes in people’s lives as they did at Imagine!. I returned, and, thankfully, was welcomed back. Some of the events that have had the most impact on me include transitioning individuals who were in non-community settings into the community, and then watching them blossom. Fortunately, this has happened many times, and seeing individuals with disabilities being a part of the community with access to technology and the expectation of growth . . . well, it’s cool. I give great credit in this process to direct support professionals (DSPs) who work every day with the individuals we serve. Their jobs can be mind-numbingly difficult and frustrating, but well worth every single headache. If you have read this far, promise me that TODAY you will locate and thank a direct support professional. They really are the people who make the rubber meet the road and are an incredible group of individuals, maybe even cooler today than when I was one of them (but don’t tell them that). The years blur together, but the gist is the same -- wonderful people all around and lots of opportunity to make differences big and small. It really is a pleasure to watch both staff and individuals with developmental disabilities grow. At our recent groundbreaking for the new group home we are building in Broomfield for aging individuals with developmental disabilities, I again felt that excitement of being part of an organization that forecasts and meets the needs of individuals and families, and, by doing so, makes the community even better. If you have read this far, thanks . . . and what are you waiting for? Go thank a DSP! On October 2, The Coleman Institute for Cognitive Disabilities will be hosting its thirteenth annual national conference: “The Rights of People with Cognitive Disabilities to Technology and Information Access.” Imagine! will be a major participant in this conference. Speakers at the conference from Imagine! will include our Chief Operating Officer Greg Wellems, our Director of Information Technology Kevin Harding, our Director of Public Relations Fred Hobbs, and our Technology Architect Alex Andrews. I am honored and pleased that so many Imagine! folks will be participating in the conference, and not just because of the prestige of the event. I feel that our extensive participation in this conference is a reflection of something we do very well – take the time to look at our world from the “30,000 foot view.” In other words, the big picture. It is easy for all of us, no matter what our job titles or pay scales are, to get mired in the day-to-day activities of our jobs and lose sight of the bigger picture. Unfortunately, losing that focus on the big picture can have unintended negative consequences and often leads to poor decision making. 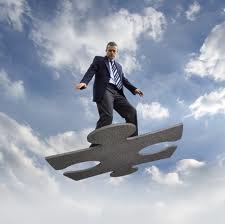 At Imagine!, we have made it part of our culture to occasionally take the time to step away from the day to day and look at the 30,000 foot view. We hold strategic planning meetings and attend retreats. We create distributed innovation groups to tackle complex challenges facing our organization. This isn’t always easy. It can be a challenge to find the time to attend these meetings, and to re-adjust thinking processes to move away from focusing solely on the here and now. But we do it because it makes a difference. It puts us in the position to have so many different Imagine! leaders speaking at national conferences such as the Colman Institute’s conference. I occasionally hear the lament from other organizations that they are just too busy or they don’t have the resources to engage in any serious long term planning or discussions at the 30,000 foot level. I would argue that that is the most important time to engage in such discussions. When resources aren’t enough to keep up with the need, that is when it is absolutely necessary to look at the bigger picture to see where changes can be made. You can’t keep going cheaper and weaker, especially when it comes to providing human services. Is it possible that the overall infrastructure for delivering services to individuals in our state with intellectual disabilities is weakening, and going cheaper? It is time for us to all rally and move beyond a myopic view of temporary and short sighted solutions to the many challenges we face, and instead look for solutions at the 30,000 foot level. If we keep a broad view, solutions may come into being that otherwise wouldn’t be visible. The time is upon us to take that broad, 30,000 foot view..
More than 400 people attended Imagine! 's 50th anniversary party on Sunday, August 4th, at the Millennium Harvest House Boulder. One of the highlights of the event was the debut of a 50 year retrospective video about Imagine!. If you weren’t able to attend, or even if you were and would like to see it again, below is the video. The video is a little more than 15 minutes long, but I think you will find it worth your while to watch it all the way through. 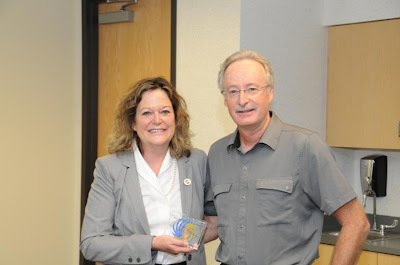 Today I offer my congratulations to Colorado State Representative Tracy Kraft-Tharp, who was the recipient of the 2013 Alliance Legislator of the Year Award. I am pictured here with Rep. Kraft-Tharp today in my role as Alliance President. Alliance is a statewide association dedicated to strengthening community services and supports for people with developmental disabilities by collaboratively advancing innovative policies and practices. Congratulations, Representative Kraft-Tharp, on this well-deserved award! 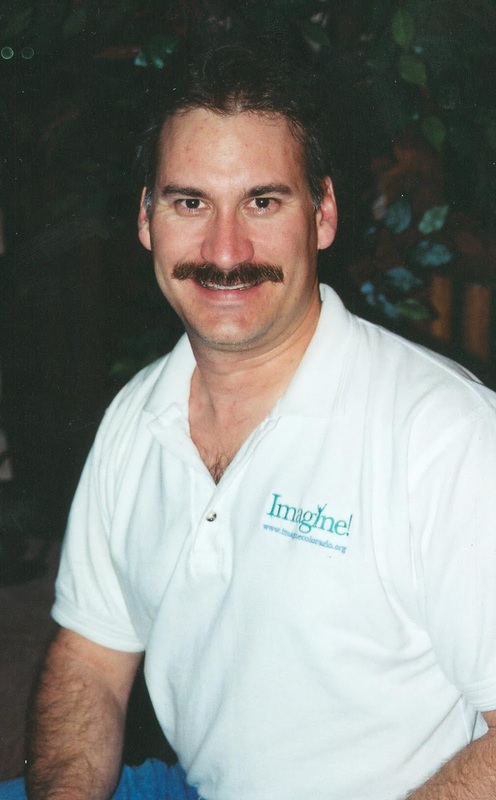 This week’s “50 Years, 50 Stories” comes from Sterling Wind, who has been at Imagine! for almost 26 years. He’s covered a lot of ground at Imagine! during that time, and the story of his growth as an employee of Imagine! parallels the growth of Imagine! itself in many ways. 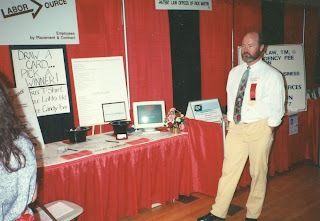 booth at a job fair back in 1995. As I sit down to scratch down a few memories of my experiences working here at Imagine!, the eloquent words of Bart Simpson come to mind: “Ay caramba.” And yes, I’m using “Ay caramba” to describe the surprise that hits me as I contemplate the fact that I am still here after almost 26 years. Although I had not previously worked in an setting like the old Developmental Disabilities Center (DDC – the former name of Imagine! ), I did have some experience tutoring and working with middle school and high school kids enrolled in special education, as well experience teaching basic rock-climbing skills to adults with visual impairments when I lived in California. I must not have flubbed the interview completely, because shortly after my interview, I received a part-time job offer to work 20-30 hours per week at a startling $3.35 per hour (the minimum wage in 1987). My plan was to work for the DDC until I got a full-time position and learn what I could learn, while still keeping an eye out for a job that paid better. There wasn’t much formal job training: in the first three days I shadowed a tenured staff member on day one, shadowed tenured staff again on day two with a little bit of opportunity to work directly with consumers, and then on day three I was the teacher being shadowed by a tenured staff. Within a few weeks, I had a “full-time” position working 36 direct-care hours with 1.5 hours for paperwork relating to the consumers for whom I served as primary counselor. My co-workers were amazing! Teaching consumers was challenging and exciting, and as a team we were pushing the boundaries to be a community-based service provider. Slowly, we transitioned from working with consumers behind the segregated walls of the old DDC to using the community, our community, as a learning environment. Our efforts increased significantly when we obtained our first “brick” cellular telephone, and a Geo Prism with a wired-in-place cellular telephone. With these new tools, our team rebranded ourselves as Labor Source and began pursuing integrated jobs out in the community. The joys of my tenure here have been so many. One of the highlights includes working with Colette Marie to write the business plan that would launch Out & About more than fifteen years ago. A few years later I would work with Colette once again to launch a program called “Stepping Stones,” which assisted high school students with developmental disabilities to gain community-based work experience during their transition from school to adult life. A few years later Greg Wellems approached me to discuss Imagine!’s SmartHomes initiative and offer me the position of Project Manager. Together with a terrific internal team, we drafted a comprehensive plan to build the first and second ever SmartHomes to use technology in a comprehensive way to serve adults experiencing an intellectual or developmental disability. The Bob and Judy Charles SmartHome in Boulder and the Charles Family SmartHome in Longmont are dynamic living laboratories where consumers, direct service professionals, and their support teams can work with young engineering students, professionals from the community, and yes, even staff members to dream, design, and test solutions that can lead to greater independence. Many years ago, a coworker taught me a powerful lesson, one that I have carried with me ever since. We were walking around Boulder, and I made a move to cross the street in the middle of the block. Yes, I was going to jaywalk. I was a little surprised when my coworker stopped me and asked me what I was doing. We weren’t at work, there wasn’t much traffic, and it was a quicker way to get across then going all the way to the crosswalk. But he explained his thinking: as employees of the Developmental Disabilities Center (what we were called at the time), we were ambassadors of our organization and role models for the individuals we served. We had to act at all times like someone we knew, or someone we supported, was watching us. Because you never knew when somebody might actually be watching us. If we expected the individuals we served to become fully participating members of their communities, we needed to model the behaviors that we, and the community, expected from everybody. I continue to use that philosophy in everything we do at Imagine!. For example, I strive to have our buildings, offices, and work sites look clean and well cared for – because if a parent of one of the people we serve sees that we can’t take care of our own offices, how can they trust that we will be able to take care of their loved ones? And that is why I think Imagine!’s wellness initiatives are so important. We all know that the national trends in the health of Americans are going the wrong way. And as a nation there seems to be a consensus that we should be doing more to change our collective eating and exercising habits, but I think most of us would also agree that that sort of change can be challenging. So, by committing to wellness as an organization, we are modeling that behavior to those we serve and our community. We’ve said we’re not going to jaywalk, even if it is the easiest way to cross the street. We’re leading the way in showing the individuals we serve that healthy living can mean more opportunities to participate in the community. I know that employees all across Imagine! are modeling healthy behaviors all the time. You see them playing racquetball at the local recreation center, at the top of fourteeners, or on their bikes on their way in to work. You see them participating in company sponsored yoga sessions or walking clubs. You see them eating salads instead of burgers, and carrots instead of fries. I envision a day when residents living in our group homes, or getting services from our day programs, will be the ones leading the way in requesting more fruits and vegetables, or suggesting a walk around the block instead of sitting in front of the television. That evolution seems inevitable to me, and I’m pleased to be a part of it. As I recall from physics class, a body in motion tends to stay in motion. Just think of the alternative. 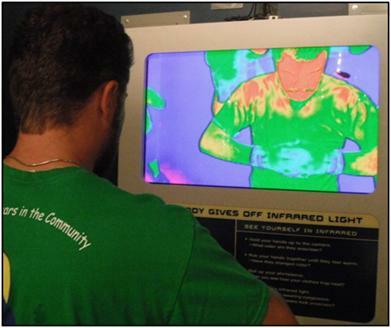 Imagine!’s Out & About program, in collaboration with the Imagine! Foundation, has developed Imagine!’s first crowdfunding campaign to raise additional funds for services for children, including the After School, School Closure Days, and Summer Camp programs. Crowdfunding is “the collective effort of individuals who network and pool their money, usually via the Internet, to support efforts initiated by other people or organizations.” You may be familiar with the Kickstarter and Indiegogo websites, as examples. Our first foray into the world of crowdfunding is another example of our efforts to explore new funding opportunities that help us sustain and grow our programs, and to ensure we can continue to provide superior services to some of our community’s most vulnerable citizens. Studies show that younger generations are looking for alternatives to traditional ways of donating resources to organizations they believe in, and we want to make sure we stay on top of this trend and continue to cultivate support for our organization and the people we serve so we can stick around another 50 years. Out & About’s children’s programs seemed like a great place to start. As these children’s programs grow and more children with developmental disabilities join, Out & About has found that its budget can't keep pace. Out & About wants to be able to continue to offer these valuable and meaningful opportunities for growth (and fun!) to all kids in our community who wish to be involved. Today’s installment of “50 Years, 50 Stories” comes from Imagine!’s Director of Public Relations Fred Hobbs. Fred is also my co-conspirator on this blog. No matter what he says below, he will always be the new guy to me! working at an Imagine! booth at a recent event. It is always a little intimidating to start a new position at a new company. It can be even more intimidating when many of your new colleagues are seasoned veterans with lengthy tenures at the organization, while you are brand new to the field. That is exactly the situation I found myself in eight years ago when I joined the Imagine! administrative team. As I got to know my fellow employees, I was both impressed and a little overwhelmed to learn that many of them had been with the company for ten, twenty, even thirty years! And not having any experience in the field of services and supports for individuals with intellectual disabilities, I frequently found myself lost as I tried to understand the depth and breadth of Imagine!’s services and the complex system that guides services in our state. I did my best to handle the situation with humor, self-identifying as the “new guy” and saying things like “I’m just here to learn” when asked my opinion on challenging issues that I didn’t feel qualified to answer. Hidden beneath the humor was some truth, however. I was learning a great deal about Imagine! and what makes it so special. I learned that Imagine!’s reputation, locally, state-wide, nationally, and even internationally as an innovator in the field was absolutely justified. And I learned at least one secret as to why. Here’s the secret: the culture at Imagine! encourages everyone to question everything. It is ok to challenge the status quo, or to ask “how can we do this better?” We push each other, but we push each other in respectful ways that lead to results instead of anger and resentment. Ranks and titles are irrelevant when it comes to figuring out how we can improve on what we do. It is perfectly normal to sit in a meeting at Imagine! and hear two co-workers go back and forth on an issue, each vehemently arguing that his/her position is the correct one, only to see them again two hours later laughing and enjoying each other’s company. The disagreements are never personal, and there is an underlying understanding behind the debates – everybody wants Imagine! to be in the best position possible to ensure that the people we serve have as many opportunities as possible to engage in their communities. We may not always agree on how to get there, but we do agree on where we want to go. Imagine!’s culture has led to some pretty amazing accomplishments over the past 50 years. Descriptions of Imagine!’s programs often include phrases like “unique,” “first of its kind,” or “only one in the country.” I have been privileged to be part of this forward-thinking organization for the past eight years, and I am inspired every day to push beyond where we are and look to where we could be. At Imagine!, we believe the integration of wellness in our workplace leads to greater teamwork, higher morale, increased productivity, and decreased absences. We have committed and will continue to commit the resources necessary to promote the physical and mental well-being of our staff. Those resources include time, incentives, education, and the long-term commitment of our senior management team to this concept. Our plan and purpose is to not only improve individual well-being, but to do so on a permanent basis such that our staff would have an opportunity to gradually make lifestyle choices that would enable them to live healthier and happier lives. We live here to walk, run, ride, paddle, splash, slide, ski, skate, or just get out of doors. We live here to enjoy an active life. This is our commitment to a healthy lifestyle. That is why I am pleased and excited to announce the launch of another year of our Imagine! wellness program. This program will include educational “Lunch and Learn” sessions, yoga, online nutrition team competitions, and more! This year, we will include incentives for employees participating in these programs, as we feel this is the best way through shared encouragement to reach our goals. We believe that the health of Imagine! results from the value we place on the health of our workforce. When we’re all healthier, we’re all happier and we’re able to focus on what we do best –enhancing the lives of those we serve. With the debut of Imagine!’s new website earlier this week, it seemed like a good time to share a “50 Years” story from Kevin Harding, Imagine!’s Director of Information Technology. Imagine! has always been on the leading edge of technology use, and below, Kevin provides some historical perspective on that use of technology over the years. Kevin Harding in the early 2000s. We’ve come a long way in a short amount of time. I wonder what the next 50 years will bring? Our big celebration party is this weekend. Join us this Sunday, August 4, from 2:00-5:00 PM, at the Millennium Harvest House Boulder Courtyard for and help us celebrate 50 years of building quality lives. There will be music, games, Imagine! giveaways, and a video retrospective of Imagine! 's 50 years of service. The event is free and open to the public, and it is not too late to RSVP if you want to join us. 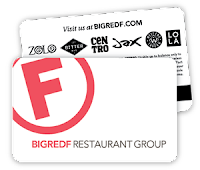 Several local restaurants have teamed up with Imagine! to create some specialty dishes and drinks in honor of Imagine!’s 50th Anniversary, and to help us meet our mission! From August 1–August 15, you will be able to purchase the “Imagine! Blueberry Dream” cocktail from any Big Red F Restaurant (The Bitter Bar, Jax Fish House—three locations, Centro Latin Kitchen, Lola-Denver, West End Tavern, and Zolo Southwestern Grill), and all proceeds will go to Imagine!. From August 1 - August 14, you will be able to purchase the “Imagine! Burger” at The Sink Restaurant in Boulder, and 20% of the proceeds will go to Imagine!. Shake and double strain over fresh ice in an old fashioned glass (10 or 12 oz). Top with splash of soda. Garnish with a mint sprig and three blueberries. Does this make you thirsty and hungry? It should! Please thank Dave Query from Big Red F and Mark and Chris Heinritz from The Sink Restaurant when you are there! And later today, the Sweet Cow Ice Cream MooMobile will be visiting Imagine!’s Dixon Office building to hand out FREE scoops of ice cream to Imagine! employees. They heard about our 50th Anniversary and wanted to offer their congratulations in a unique and delicious way. So if you are visiting either Sweet Cow location (Denver or Louisville) be sure to thank the main moo man Drew Honness for his generosity. And finally, check out this newspaper article about our 50th! Lots of good information.